These are descriptions of the most common canine eye problems. Dog eye cataracts in general is opacity or cloudiness of the lens. As a result, light does not reach the retina and visual images are not produced. Eyesight thus becomes weakened over time. The severity of the condition depends upon the opacity of the lens. In dogs, it is a mostly inherited canine eye problem. Other causes include diabetes mellitus, dog eye injuries, radiation, inflammation and as a reaction to drugs. Dog eye cataracts can get severe with age, thus early preventive measures are required to delay opacity. 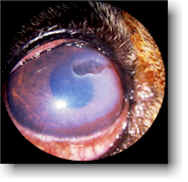 Dog Glaucoma refers to pressure over the eye due to an imbalance in the flow and production of fluids. The fluid exerts pressure on the retina and optic disk, resulting in the destruction of both of these vital parts of the eye. In dogs, canine glaucoma can be open angle (painless and chronic) and closed angle (sudden and severe pain with redness and loss of vision). Dog Glaucoma is most commonly characterized by enlargement of the eyeball, lens displacement and broken membranes which may also cause rupturing of the capillaries. Generally, ulcerative keratitis it is called a canine corneal ulcer, which are slow healing lesions which occur on the surface of the cornea. Common causes of a dog eye ulcer are injuries, foreign particles, chemicals and sometimes infections. Ulcerative keratitis is characterized by pain, swelling, dysfunction and protruded blood vessels. Secondary infections and the complete loss of dog eye function are some of the complications related to this canine eye ulcer in dog condition. Canine eye infections are the most common dog eye problem. 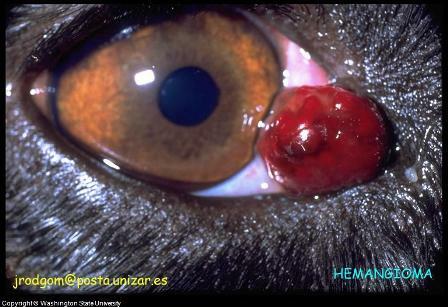 Dog eye infections are caused by different viral, bacterial and in rare cases, fungal agents. The eye as a whole or part of it may get infected. 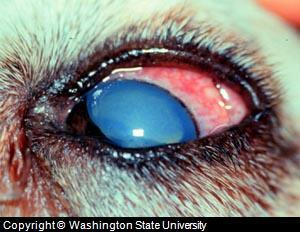 The most common sign of a canine eye infection is inflammation. Inflammation can be identified by its typical signs, i.e. redness, swelling, pain, increased temperature and loss of function. Conjunctivitis, Blepharitis, Pannus, Chorioretinitis etc. are some common forms of canine eye infections and inflammation. Dog eyes are prone to some parasites. Dog eye worms, which are named as Thelazia californiensis and Thelazia Calliapaedia are parasites which can infest a canine eye. These worms are 0.5 – 0.75 inches long and are very active. They roam over the surface of the eye, tear ducts and conjunctival sac. As many as 100 eye worms can infest an eye, which will cause clinical dog eye problems, which should be immediately attended to. These worms are transmitted by common house flies. 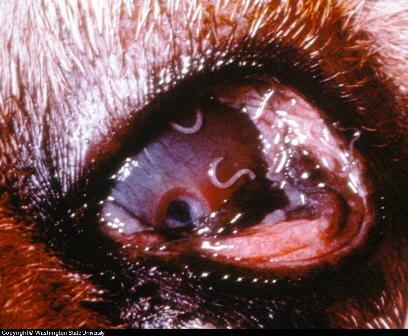 Symptoms of dog eye worm infestation are excessive tearing, conjunctivitis, opacity and sometimes blindness. Dog eye injuries such as dog eye trauma, injuries or accidental conditions which can happen and cause damage to any part of the eye are some other common dog eye problems. Injuries can be mild to severe, superficial to deep and may involve one or more anatomical features. The dog eye trauma should be carefully examined and treated accordingly; minor to major surgeries are usually required in treating dog eye injuries. Dog eye irritation is caused by foreign objects, dust, hairs, broken eyelashes, gases, chemicals, pollens and many other culprits. All can cause irritation over the surface of the eye. Dog eye irritation is characterized by acute redness, watery eyes and extreme irritation. Tumors and Cancers of a primary (started in the eye) and secondary tumors (spread from other areas of the body) may occur in dog eye, involving different types of tissues. Commonly, eyelid tumors, orbital tumors, corneal tumors and uveal tumors are reported clinically during routine examination and diagnostic approaches. These cancer dog eye problems may be malignant (fast spreading) in nature, but most of them are specific to the eye tissues. 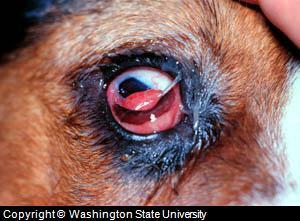 Dog cherry eye is a condition that occurs in young dogs when a dog's third eyelid moves out of the normal position. It sticks out or protrudes from behind the eyelid and appears as a red mass. The condition exposes the dog tear gland, which can result in irritation and infection and in a lack of tear function. Surgery is used to correct this condition by creating a "pocket" for the gland near its original location (it cannot be put back in the original location). The gland is then sutured inside the pocket. Some dogs need to return for a 2nd surgery. A side effect of the surgery is temporary inflammation which can last for 1 to 2 weeks. Surgery is preferred for cherry eye dog instead of removal of the tear gland, since this can result in dog dry eye (keratoconjunctivitis Sicca). 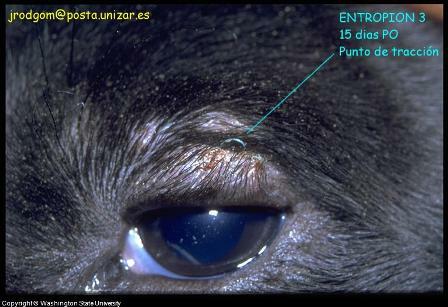 Canine entropion refers to an eyelid that rolls inward. The condition is considered to be genetic and specific to certain breeds including Shar Pei, Chow Chow, Bulldog, Retrievers, and Rottweiler. Treatment for this dog eye problem is surgery where the eyelid is restored with the removal of some muscle and skin. Surgery occurs during months 4 to 6. A second surgery might be needed to correct any changes in eyelid alignment as an adult. Canine dry eye or dog dry eye is a condition where their aren't enough tears being produced. It has an unknown cause, but is thought to be caused by genetics, canine distemper virus, the use of certain medications or removal of the lacrimal gland to cure dog cherry eye. Symptoms of canine dry eye include mucus, redness, cloudy eyes, rubbing, and pigmentation on the cornea and blond vessels. This in turn causes a worsening of the dogs vision. Treatment for canine dry eye includes tear stimulation, lubrication and reducing any scar tissue that is causing the dog eye problem. Treatment includes medications such as Cyclosporine and Tacrolimus. Though each of the aforementioned canine eye problems are identified with specific symptoms, common signs such as redness, swelling, excessive tearing, rubbing, irritation, opacity, in coordination, discomfort and protruded blood vessels may be exhibited in almost all of the conditions. Clinically, different conditions are required to be identified on the basis of these signs and the severity, location, history and acuteness of the way the problem is exhibited. None of these conditions can be confirmed on the basis of these symptoms alone. Detailed clinical examination with the help of special apparatus and approaches are essential for making even an initial decision in determining a diagnosis. 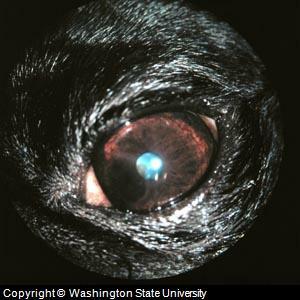 Clinical history, examination and repeated clinical observations are the initial step toward reaching a diagnosis for some acute and almost all chronic dog eye problems. Special apparatus and approach along with expertise is required to make a decision. Laboratory diagnosis may include different culturing tests of any discharge and fluid. Test used include the Schirmer test (dog tear production test), Flurosecein test, tonometry (eye pressure), cytology (cell study) and gonioscopy (eye angle test) etc. Some advanced testing procedures include ultrasonography, Flurosecein angiography (blood vessel test), bio-microscopy etc. might be needed in diagnosing dog eye problems. Some of these tests require localized or general anesthesia. Once the diagnosis for the exact dog eye problem is confirmed, the condition identified is specifically treated. Special formulations of therapeutics such as antibiotics, anti inflammatory drugs and anti parasitic medications are administered locally in the form of ointments, drops, opthalmic solutions and orally in the form of tablets, syrups etc. Surgery is another widely used technique for treating various eye problems in dogs. It is always recommended that surgery should only be done by a professional surgeon, preferably a specialist. For treating mild conditions and routine cleaning it is recommended that owners use natural remedies, these are not only safe but support eye health. To promote healing look for a product such as Eye Heal and for cleaning I-Clenz.